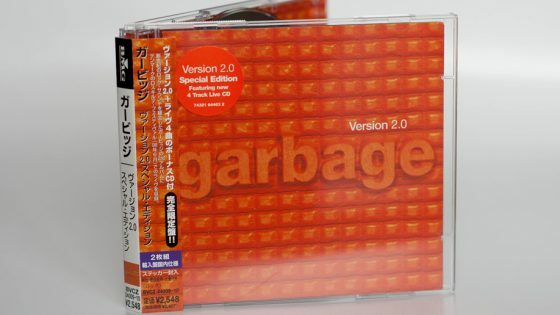 Promotional copy of the special edition Version 2.0 issued in Japan. The wrap around OBI strip has a white sticker placed over the barcode, the case is factory sealed. Ⓟ 1999 Mushroom Records LTD.
© 1999 Mushroom Records LTD.
Special Edition CD, 16 tracks (standard track listing + Dumb (Live at Roskilde Festival 1998) / Stupid Girl (Live at Roskilde Festival 1998) / Temptation Waits (Live at Roskilde Festival 1998) / Vow (Live at Roskilde Festival 1998)) in double crystal jewel case.